Dr. Kellie Schaub D.D.S., M.S.D. Achieving a natural looking and realistic smile after tooth loss is possible with dental bridges. Dental bridges are one method used by dentists to fill a gap created by a missing tooth or teeth. Dental bridges can be placed to fill in gaps left by missing teeth. Bridges not only make it easier for patients to speak and eat, but they also prevent surrounding teeth from shifting out of place. Dental bridges consist of one or more artificial teeth that are held in place by dental crowns. The procedure to place a dental bridge requires two visits: one to prepare the adjacent teeth and take an impression of the area, and a second to place the bridge once it has been custom made from the impression. Dental bridges, like implants and partial dentures, are used to replace missing teeth. There are several types of fixed dental bridges (cannot be removed), including conventional fixed bridges, cantilever bridges and resin-bonded bridges. careful to clean well under this prosthesis. 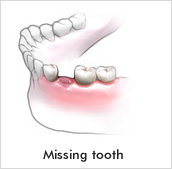 Typically, conventional and cantilever bridges require shaping of the teeth surrounding a missing tooth. Crowns are then placed on the shaped teeth and attached to an artificial tooth. A resin-bonded bridge requires less preparation of adjacent teeth. It is often used to replace front teeth, provided that the gums are healthy and the surrounding teeth do not have extensive dental fillings. support the bridge. If the support teeth are decayed or badly broken down, your dentist may have to build them back up before they can be used as support teeth for a bridge. Next, our dentist takes an impression of the prepared teeth with a putty like material that is used to create a model of your teeth. Your bridge is fabricated based on this model by a skilled lab technician so that it precisely fits the prepared teeth. 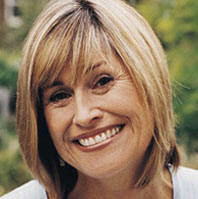 It is important that your restoration fit perfectly to avoid additional oral health problems such as tooth decay. 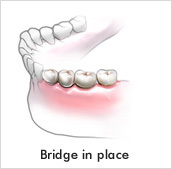 While your bridge is being fabricated, our dentist fits you with a temporary bridge so the teeth and gums can be protected from damage until your permanent bridge is ready. To complete the dental bridge procedure, you must return to our dental office for a second visit to have the bridge fitted and cemented. As an Indianapolis dentist, my work is to please you. Indianapolis Dental Center provides a number of prosthodontic services to teeth-whitening services. We have the latest in technology resulting in more comfortable dental procedures. Our goal is to offer the highest quality dental care at affordable rates. The staff will file your insurance, and offer a variety of payment plans. Having a dentist in Indianapolis like Dr. Kellie Schaub will give you a masterpiece you can shine on your friends and family every time you smile. Contact us or schedule an appointment online to find out how our dental artists can give you something to smile about. Call Us Today!! Indianapolis Dentist - Dental Center - Dental Implants, Dentures, Dentures Lab. A dental lab enables us to create custom new dentures. Our general dental services has a dental laboratory to augment denture implant services. Prosthodontic services include implant crowns, full mouth reconstruction, partials, and dentures. Indianapolis general dentistry services include teeth cleanings and fillings. Our full line of cosmetic dentistry procedures include bleaching, teeth whitening, dental crowns and dental bridges, porcelain veneers / laminates and smile makeovers. Reproduction of any material on this site without written permission is strictly prohibited. © Copyright 2012 - Dr. Kellie Schaub, D.D.S., M.S.D. All Rights Reserved.